Today we are playing with Paintstiks. 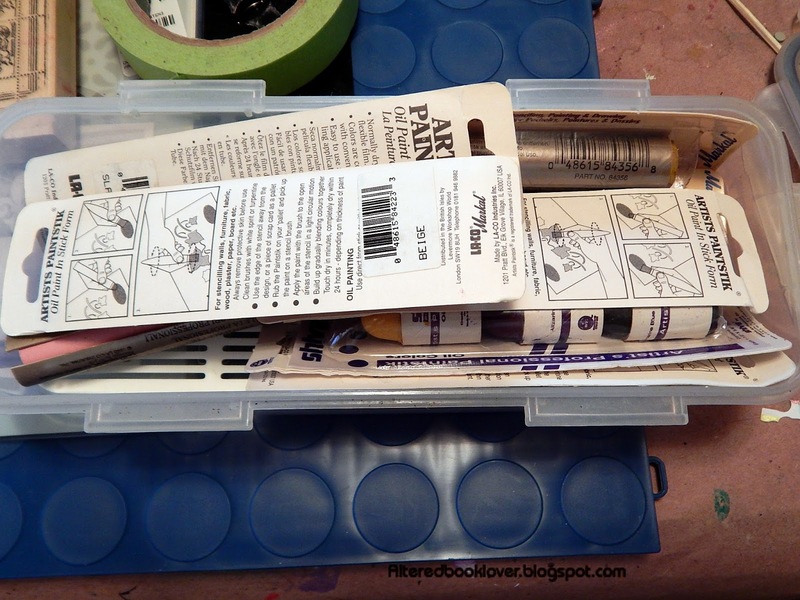 With the lid off the container, you can see the Paintstiks. These Paintstiks were purchased on the internet. My artist friend Kathy purchased two sets and I paid her for my share. In the U.S. these are known as Shiva brand, while in Europe and parts of the U.S. they are known as Markal brand. They are real oil paint in solid stick form. Kathy got more colors than I got, but it was only fair, since she was the one who ordered them because I don't order anything on the internet. 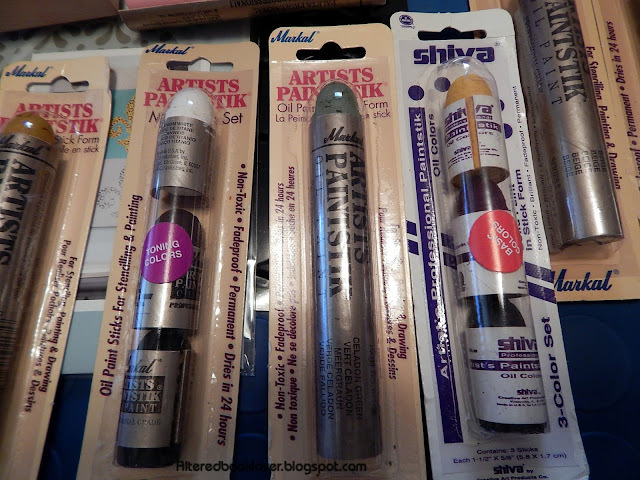 The first thing you have to decide is what Paintstik(s) you want to use. Then I suggest you decide if you want to use stencils or not. If you are talented like some of my artist friends, you might want to draw something freehand. Me? I need all the help I can get. One thing you need to know is the Paintstik dries after about an hour of non-use and forms a hard skin over the top. This skin must be removed before you can use the product. The last time I tried to cut the skin using a craft knife. I'm so afraid of those things and lost nearly ALL the top round part (see rounded part as they come in package). So this time I tried to use a paper towel as suggested by the site that sells them. When that didn't work, I tried using the hand dyed fabric. That didn't work, either. Not wanting to get out my X-acto knife again, I decided to see if I could shave the skin. YES!! 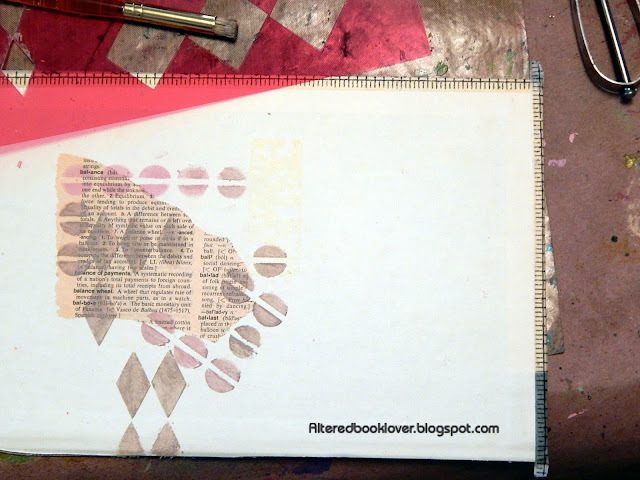 Next, I laid down some paint on my really ugly craft mat and used my stencil brush to pick up the paint. I also shaved the gray, another Paintstik I botched with my X-acto the first time I used them. You can tell when the skin has been removed, as you can see here. Here I've used a stencil to create lines on this piece I am making for a friend. I did the same using the gray with a different stencil. I blended the first two colors together, but wasn't sure I liked how they turned out, so used my hand dyed fabric to remove any final bits of Paintstik from the stencil brush before going to the next color. These paints are SO expensive, even a tiny amount should be used and not wasted. 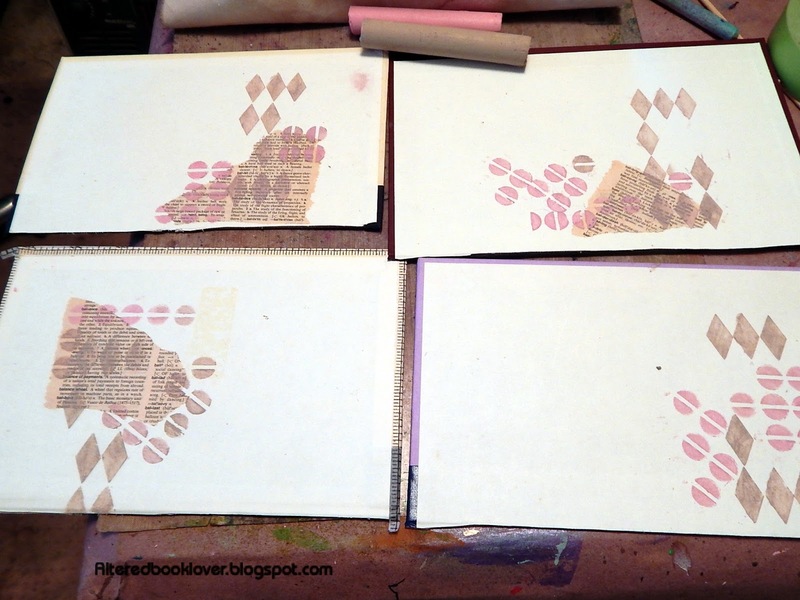 Here are the results of the four book covers I stenciled. I plan to turn these into gifts. 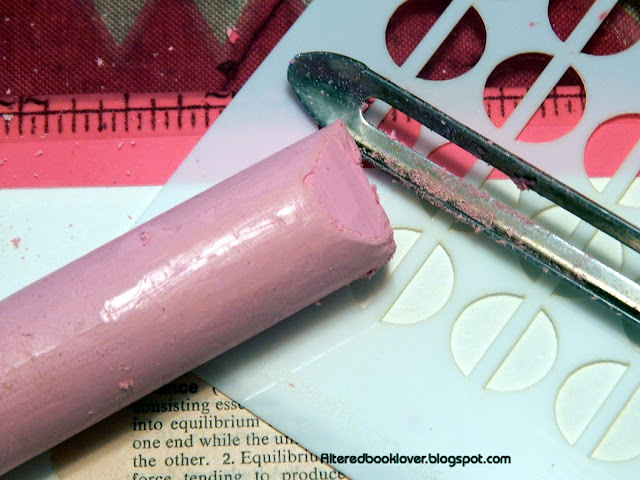 Be careful to keep the excess paint bits off the surface of the substrate, though. 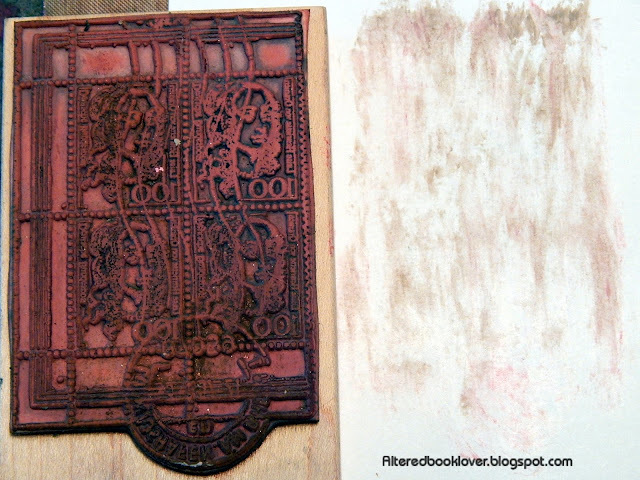 Instead of blowing the excess paint away, I rubbed it as seen in the top left book cover. 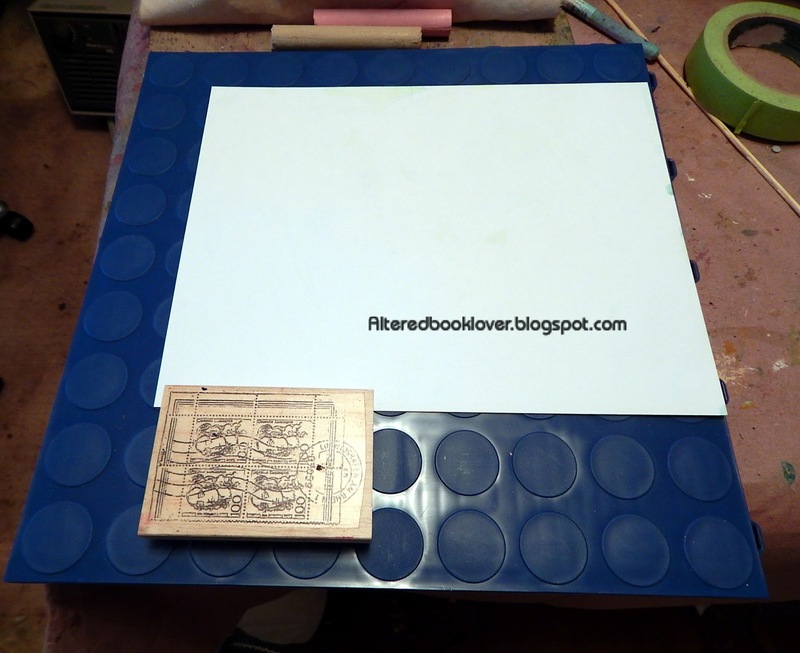 Now it was time to see if I got good results from rubbings. Apparently, this is what they are most used for. 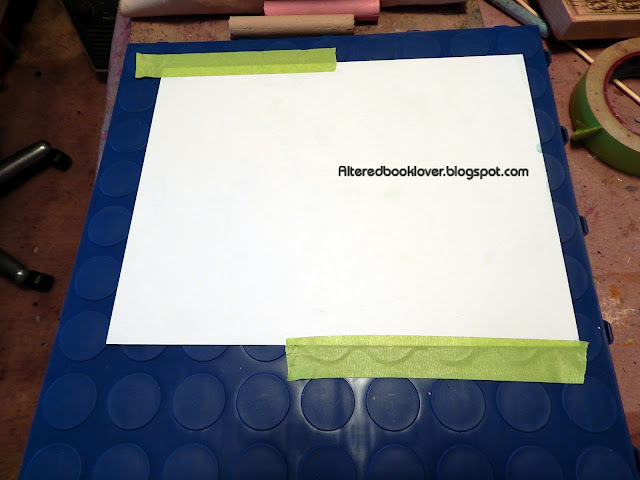 For this, I needed to tape the card stock to the piece I would be rubbing. What a disaster. This was NOT working well at all. You can't even tell what it is. So that part of my experiment has failed. Although I was quite pleased with the stenciling, the rubbing was not successful at all. 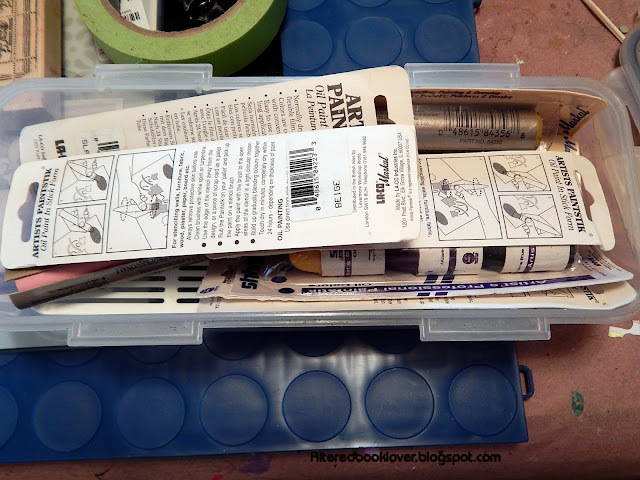 However, I remembered to place the potato peeler in the container with the Paintstiks so it would be handy and not get mixed up with my other peeler in the kitchen. I wouldn't want anyone to ever accidentally use it to peel food ever again. 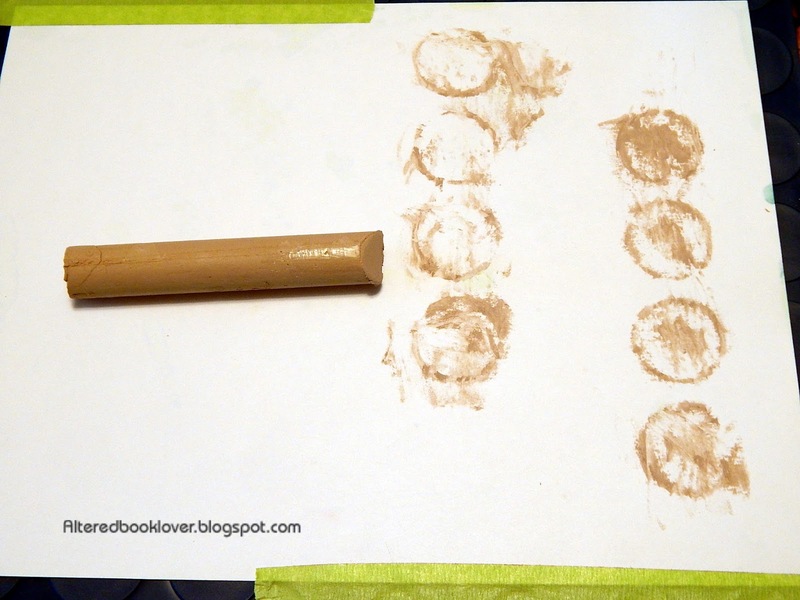 To make these permanent, you must wait at least 24 hours, then iron the Paintstik under your craft sheet or parchment paper. What I learned and what I inferred. 1. Use a potato peeler to remover the Paintstik skin if you are not skilled with an X-acto knife. NEVER use the potato peeler to peel anything food related again. 2. 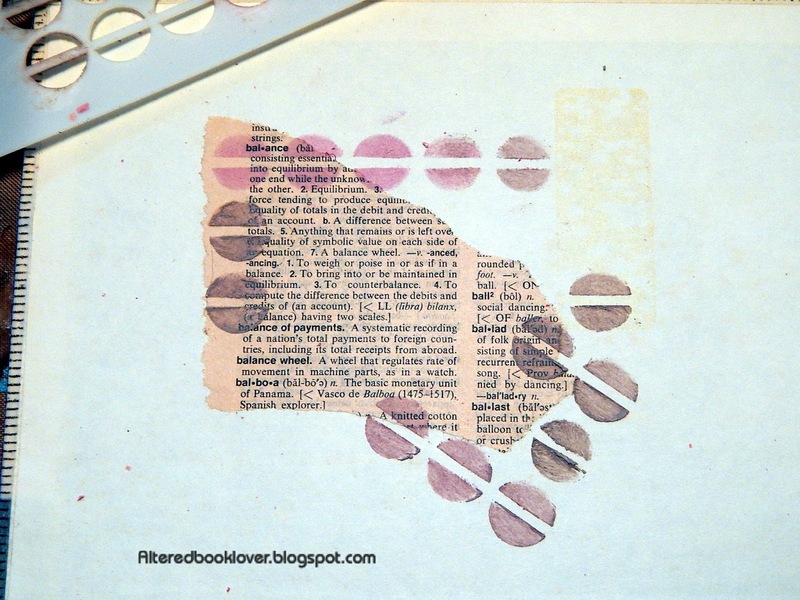 Removing the paint from stencils was as easy as wiping it away. It was so easy, I thought I was dreaming. 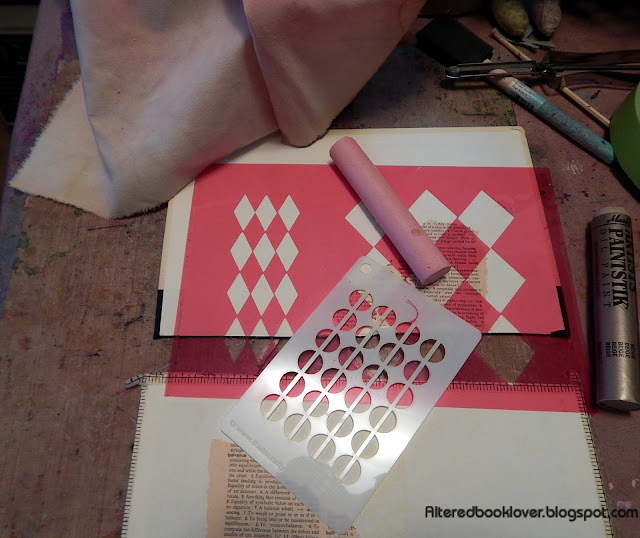 I used my hand dyed fabric to wipe and remove the excess paint from both stencils. 3. I believe the reason the rubbings weren't successful was because the surface of the paints weren't flat, but were concave (dipped inward) and didn't provide good coverage. 4. 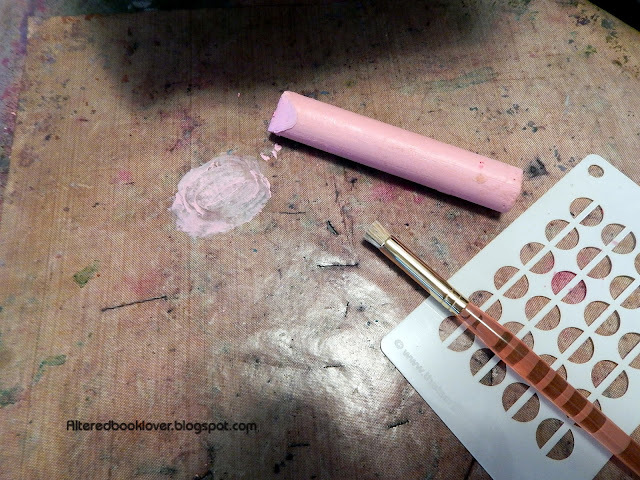 After awhile, instead of placing the paint on my craft mat, I simply dipped my stencil brush into the paint and rotated the brush to achieve good coverage. 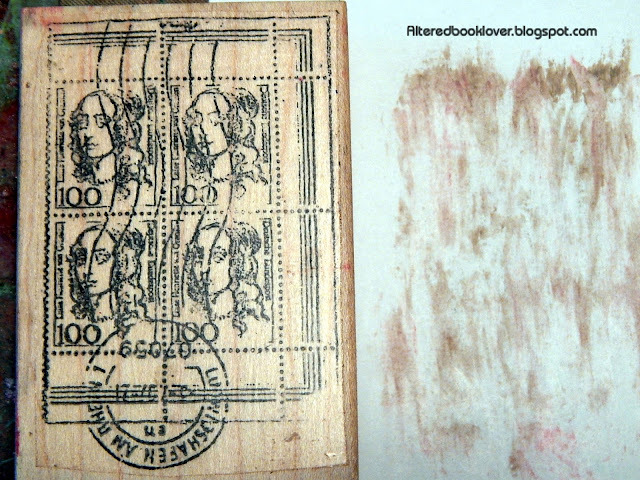 That made the paints concave and didn't allow adequate coverage for the rubbings. 5. 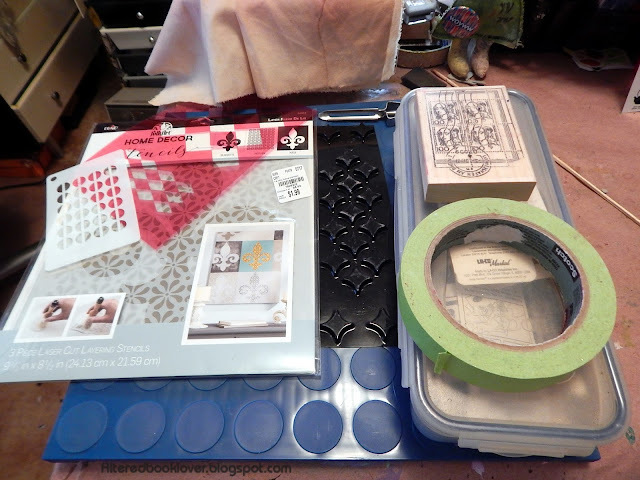 Don't forget you must wait a minimum of 24 hours, then iron the product under parchment paper or your craft sheet to permanently set the paint. In fact, the longer you allow this paint to dry, the more vivid it will be. After that, especially if you are painting on fabric, which should be ironed on both sides, it can be washed in your washing machine. It is also fade resistant. I sincerely hope you learned a bit about these Paintstiks today. If you have them and use them, please let me know in your comments. Once this has gone live, you'll be able to find this post on my Tutorials page. Thanks for joining me today. I really appreciate it. If you would like me to continue these monthly tutorials in 2018, please let me know in comments. I'm not adept with a kraft knife either. 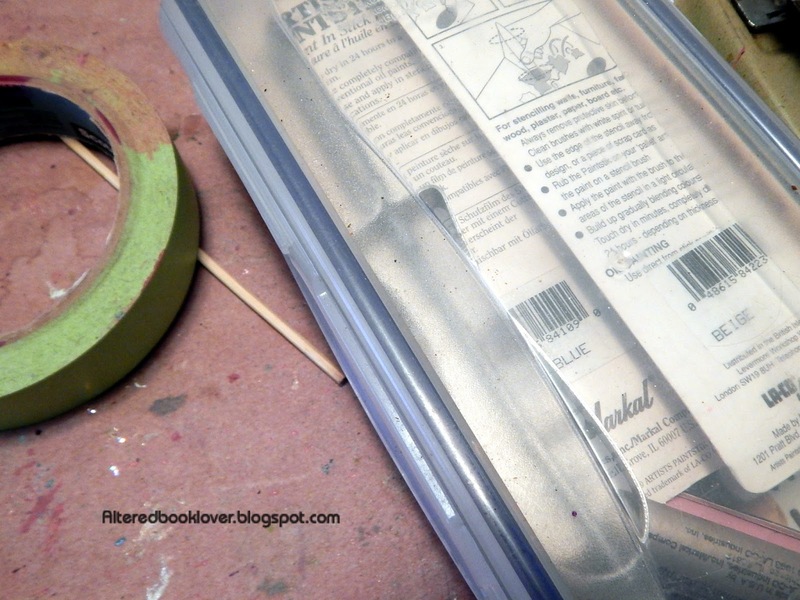 Too keep the paint stick from drying out when not in use, could you store it in a plastic, zipper type bag? Even though things didn't turn out quite as you expected, still looks like you had fun. Can't wait to see the finished covers. I'm sure your books will will be fantastic gifts. I like the way these stenciled and thought the circle rubbing looked pretty cool even though you were disappointed. I’m actually surprised you got any texture using cardstock. 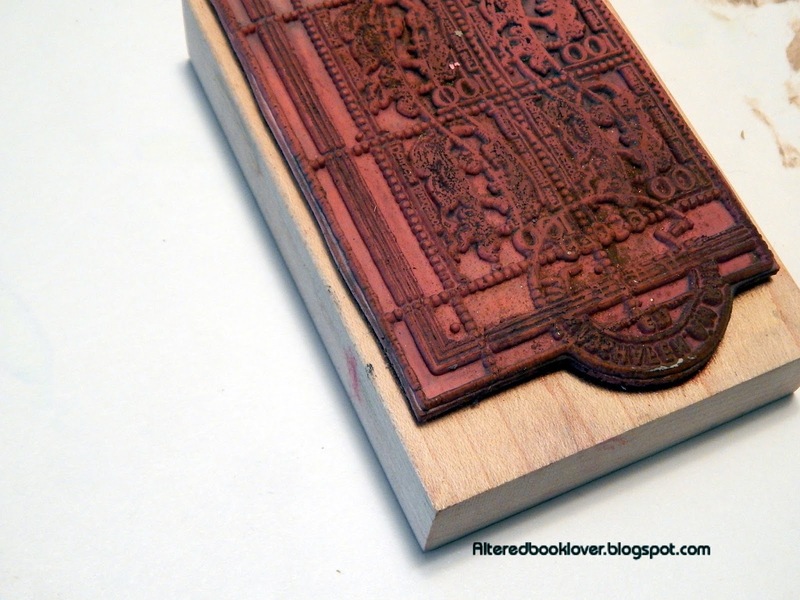 It is too stiff to make good rubbings You need paper that has some flexibility. Mulberry paper is probably about right. Try a bunch. Everything from printer paper to tissue paper and see what works best. What an interesting project. I didn't realize you could dye material with black beans. And I love the idea of "rubbings" after seeing some at one of the cathedrals in England. The Painstiks remind me of oil pastels. I hope I've caught up on all your posts. And thank you so much for keeping up with mine and always leaving me the best comments! You asked about the berries in the water at Southern Exposure and yes, those are cranberries floating there. I've started doing that and when done, tossing them outside for the birds. Win Win! I was really interested to see how you went about things. I'm not very good with anything artistic but I always admire those who are. The covers turned out super in my mind! 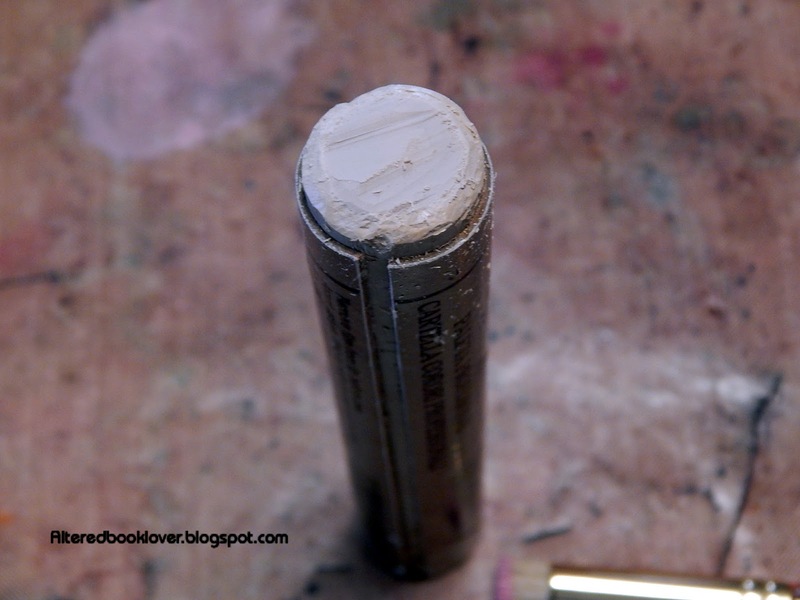 I have just one of those paintsticks in white - I ordered it many moons ago for portrait painting - but didn't use it often. It was a not needed purchase for me I guess-lol. 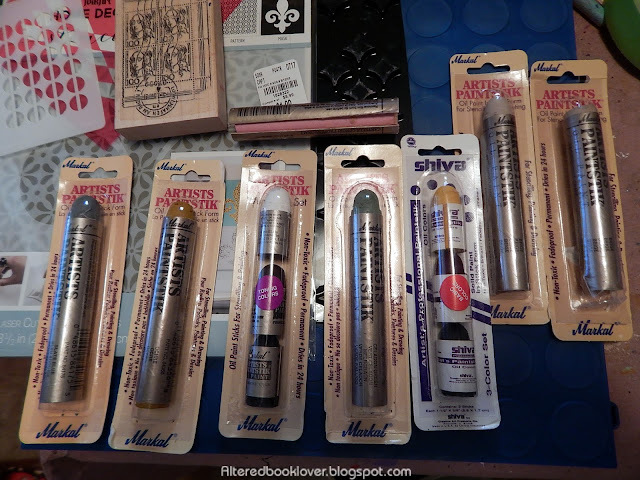 I have also seen ( on YT )that this very expensive sticks from Shiva ( or other brands - they are all expensive)are good to use on encaustic projects - but I would not order them for this purpose since I would take unexpensive oilpaint or oilpastels or even waxcrayons instead. I would love to see you trying the same techniques with oilpastels or waxcrayons and how this would work for you! I remember that you tried something with oilpastels recently but can't remember the tutorial exactly. 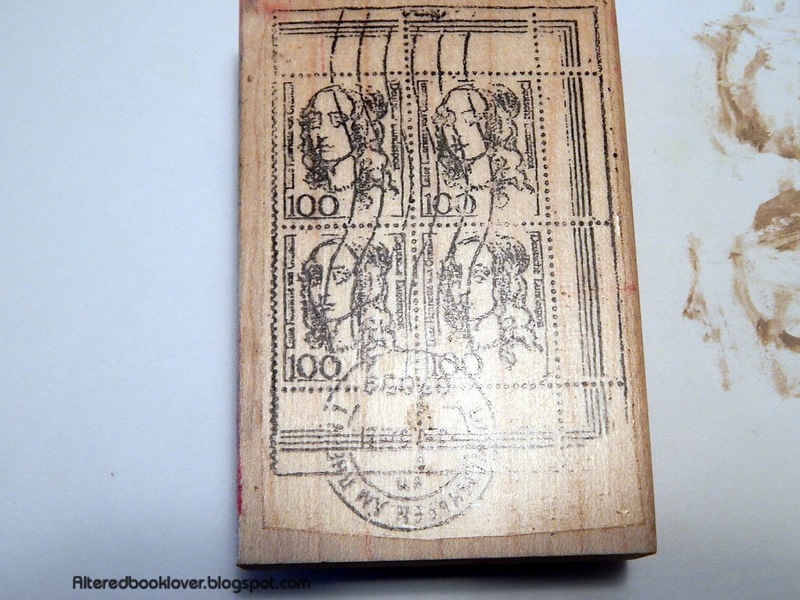 You can get a good impression of a stamp image with oilpaint. I tested this once to go over it with watercolours to try out how this resist would work,it worked well but I didn't repeat it, since it needed so long in the end for the oilpaint to dry and my oilpaint didn't smell good. And YES YES YES please continue your tutorials - I appreciate them and they always inspire me! this was great, I have some but still have not used them. Love how your finished project looked. I'd never heard of a paintstik, so everything about this is new to me. Such an interesting project!